K-Star Patrol is a game which has space ships confronting alien attack ships and an intergalactic leech. The package, with graphics, contains one ROM Cartridge and a 12-page, full-color instruction booklet with complete rules of the game. The cartridge fits Atari 400 and 800 personal computer systems. 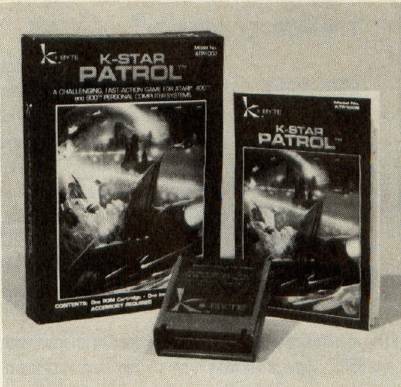 K-Star Patrol, space game from K-Byte. Division of Kay Enterprises Co.